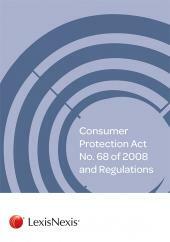 The Consumer Protection Act 68 of 2008 (CPA) has had a major impact on the way in which suppliers and consumers do business. This publication provides essential commentary to the legislation and case law, highlighting the main issues of consumers protection law from both a business and legal perspective. Since the first Edition, there have been significant developments in the law relating to consumer protection in South Africa and this has necessitated a complete revision of this first edition. The authors consider issues relating to conduct and supply, conclusion of agreements, enforcement and redress. New chapters include Proceedings before the Tribunal, Consumer Class Actions and E-commerce to address the growing number of consumers transactions occurring online. Consumer Protection Law in South Africa Second Edition will greatly assist practitioners, researchers, suppliers, consumers, enforcement institutions, students and regulators in providing an in-depth view of consumer protection law. I wish to congratulate the authors on producing this work – it is impressive! The second edition of CONSUMER PROTECTION IN SOUTH AFRICA is bound to make a considerable - and much needed - contribution to the growing body of South African consumer protection jurisprudence. Academics, both nationally and internationally, students, practitioners and consumer protection agencies will benefit richly from this comprehensive, insightful, well-researched and scholarly work.